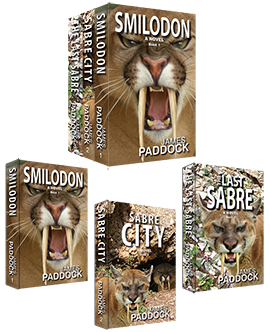 Imagine recreating the saber-toothed cat for fun? The possibility sounds exciting, but the reality could be nightmarish. In this trilogy of full-length novels we are drawn into in a world where man becomes the hunted, where cats change the rules and people run for their lives. Freelance writer Zechariah Price flies into the frozen mountains of Montana. The assignment drops him into a world of Bengal tigers, illegal aliens, prehistoric saber-toothed cats, and psychic premonitions. As the possibility of death by man and animal surrounds him, he quickly learns that he too may be destined to become food for the cats. Trapped between man and beast, his assignment turns into that of survival. It's 8 years later and Zechariah Price assumes it is all behind him. Nightmares filled with huge sabre-toothed cats and women screaming still leave him in cold sweats, though less often. There was no way he or any of his family was going to set foot in that Montana wilderness again. His 16-year-old daughter, however, decides otherwise and, in hopes of finding out what all the fuss was about when she was just a child, runs off to visit a Montana woman she found in a chat room. She discovers a lot more than she could have imagined, including who her father really was and how much she had inherited from him. Rebecca (Reba) Price, Zechariah's daugher, cannot stand the oppressiveness filling her Texas home. Her sister, aunt and maybe even her father blame her for her mother's death. She cannot disagree. Hacking into her father’s accounts she takes what she sees as her rightful inheritance and escapes to school in Montana. She convinces herself it’s not to be near where her mother died nor near the sabre-toothed cats. However, as her freshman year ends, she is drawn back into those mountains, only to discover that the plot, which drove her mother to sacrifice herself for her family, is alive and well. As body count rises–human and sabre-toothed feline–Reba must call upon all her inner power to find a way to bring it to a final end. "A thoroughly enjoyable read--well paced with plenty of tension and excitement. The writing is invisible--meaning that it gets out of the way and allows the reader to submerge themselves in the tale. I'm very much looking forward to reading the rest of the series." Mary O. "This was a very gripping book... it's intensity and suspense picked up speed like a freight train and did not stop until the very last page. James Paddock has a knack for wrapping the reader in a spider web of intrigue and suspense that will leave you with tingling feet and the hair on your neck standing on end. I highly recommenc this book a MUST READ!!" superman_all_the_time.